In Which I Praise Simplicity – Notorious R.O.B. One of the reasons why I’ve been so busy of late is the sheer amount of work I took on at OnBoard. I hope to be able to share with everyone some of the fruits of that labor sometime soon. 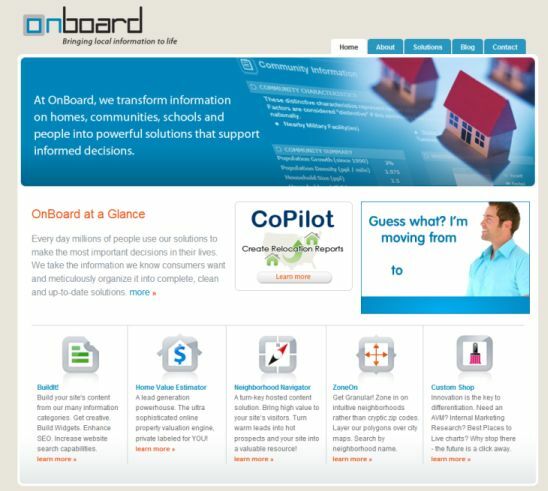 One major project is a redesign of the OnBoard website. Quite a few of the people in real estate are focused on using the web for marketing purposes, so I thought folks might find a peek into some of the decisionmaking on our website interesting. From the start, I knew that I wanted to simplify the website as a whole. The current OB website is actually pretty decent, but like many such websites, I feel that it’s trying to do too much on the homepage. We have top navigation, we have an image area with copy, we have the “OnBoard at a Glance” area, and then two internal advertising areas. Below them all, we have our product portfolio. Again, this is not a bad website. It gets the job done, and easily directs visitors into our products. Compared to some of the real estate websites out there, it’s actually a work of stunning clarity and simplicity. Which says volumes about the standard of design in our industry…. The two sites are hard to compare, as they serve very different business needs, and are in totally different industries. A site design that works for a graphic design agency does not necessarily work for a company like OnBoard, which supplies data, content and services to large real estate and media companies. At the same time, the principles of design remain the same. 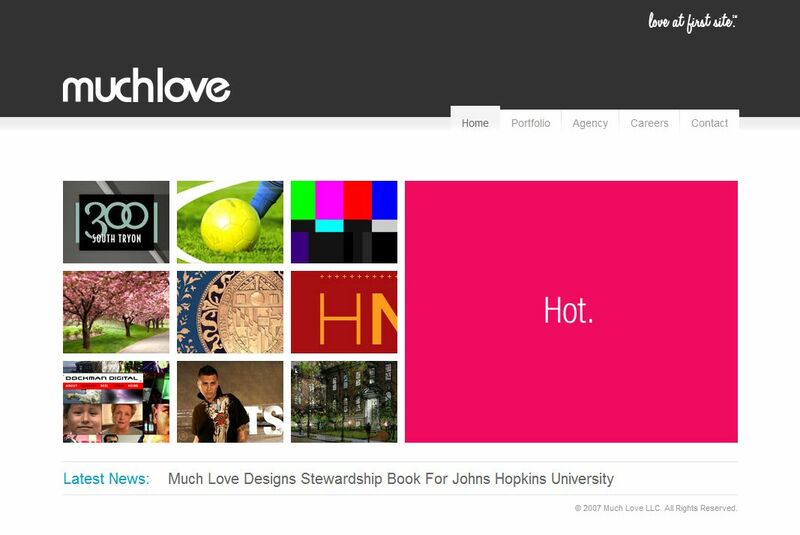 Muchlove cuts out almost everything that is extraneous to its central message: they design websites. The portfolio takes center stage. The large graphic emphasizes… well, hotness, with both the word and the color. It’s simple, it’s straightforward, and there are few distractions. I am coming to believe that on the web, less is more. The reason, frankly, is that we are past the Information Age and well into the Information Overload Age. The average American adult is exposed to 600 ads a day (PDF). We are absolutely bombarded with advertising and marketing messages. Do a Google search lately? You’ve just been bombarded with PPC advertising. Go on any consumer-facing website, and chances are, you’ve been hammered with ads and marketing messages. The task as a marketer myself, then, is how to stand out from the crowd. One strategy is the Bigger, Better, Brighter: make sure my ad is bigger than the others, better (in some way, whether creative or design) than others, and more noticeable than others. Problem here is that people develop an immunity to marketing pretty quickly. Wasn’t that long ago that the New Media industry thought that banners were garbage, and that skyscraper ads were the future. Or interstitials. Or Flash ads that dropped down to obscure the whole page. There is an alternative approach, which is to value not the impression but the engagement. If someone is being bombarded with 600 ads per day (a staggering 219,000 ads a year) then she has to develop ad-immunity simply in order to go about her daily life. By the time someone like that ends up on my website, I figure she’s not looking to be bombarded with even more marketing and advertising. So, I am taking the simplicity approach. The point is to engage the visitor, to provide useful information in a clean and clear format, not to overwhelm them with images and copy and a hundred things to look at. It’s better, in my view, to have someone’s focus for 20 seconds than her distracted ‘surfing’ for 5 minutes. The discussion that we had, as a team working on the new website, was fascinating. Some loved the concept of going simple; others thought it was boring and lazy. “Nothing really stands out” was the common complaint. The answer, as usual, is “depends”. If you’re a graphic design fan, then certain things appeal to you that may not appeal to members of the general public. If your sense of aesthetic leans more towards modernism, then perhaps you find things interesting that others find bland. Some people love this ultra-sparse look. They appreciate the balance of open space with the light, with the proportions of the ceiling with the room, the placement of the spare tables, and the use of lighting, etc. Other people find it cold and chilly, like a museum where you admire things instead of a clothing store where you want to try things on. Still others simply find this type of interior boring, colorless, and entirely without soul. Thing is, even this second store (an Emporio Armani) can do this in the physical world because of the cost of leaving once there. A customer who wants to buy something will likely ignore the “art” all over the store and just see it as decoration, because she can’t be bothered to walk out, get in a car, and travel to another store. Conversely, maybe they spent a bunch of time getting to the store, and they’re not likely to leave or get overly distracted by the decor. Such is not the case for websites. There is absolutely ZERO barrier to exit. If the visitor doesn’t find what she’s looking for in the first few blinks of the eye, she’s outta there. The power of the BACK button is immense. What may seem like visual richness ends up being merely a distraction that impedes the serious shopper and encourages loafers and window-shoppers. That is one concrete reason why I prefer and advocate simplicity in web design. In past projects, whenever I ended up adding to the homepage of a website, I felt it detracted from it. Granted, the CEO or the client may have had great reasons for wanting the Company News on the home page. I never once thought it added to a website’s design or usefulness. Some companies love having beautiful images or cool Flash animations showing off their properties or their design sense or what-have-you. I never thought those added to a website, unless the point of the website is to showcase designs or properties. A single search box. A list of “Popular Cities” and “Fun Searches” on the right. An invitation to agents. That was it. Simple, to the point, and there was no confusion whatsoever. There’s just so much stuff! I feel sensory overload the second the page loads. Where do I go? What do I do first? What’s this Search smarter business? Maybe I should look into tha… whoa, but there’s this Q&A section… and all these Trulia Trends and… hey, little talking heads and photos, that looks cool, and… truliaexplore must be worth checking out, right? Right? 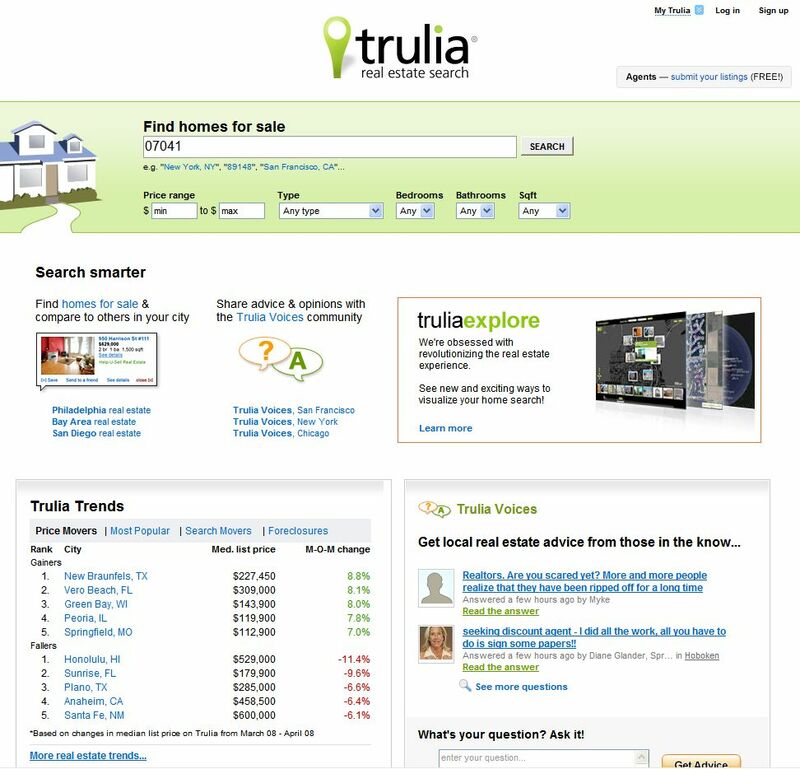 I’m not at all convinced that all this information overload helps Trulia, or makes it a better website. If the goal is to get a visitor to do a property search… then this home page rather overwhelms her. 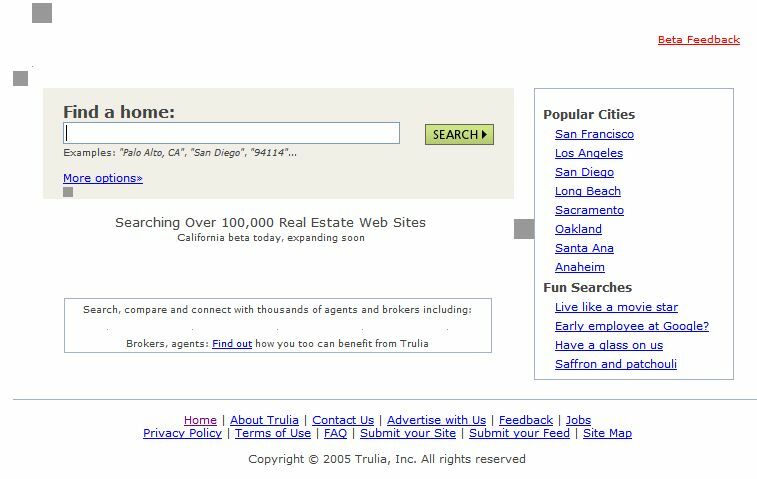 Maybe Trulia is achieving all of its goals with a design like this, in which case my aesthetic judgment is completely meaningless. But it’s difficult to say a confusing busy website like this is good design. Simplify. Then simplify again. Cut until it hurts. Then cut it some more. In the end, I think you end up with a better, tighter, cleaner and most importantly, more effective websites. NextNext post:So… Anyone Going to Inman SF? I am a mere one person Brokerage who has to do it all, wear all the hats. Including web design & seo. I absolutely know I need help with all that, but it’s a work in progress and I’m learning every day. But as a working mom, I only have so much time in a day too. Question about simple design, and “not a lot of words….” While I love the look of that clean design, does that or does that not hurt the SEO ranking as that homepage is the primary page that is crawled & indexed for keywords and changing information? I would love to simplify my design, but if it means I won’t be found, what is the point? Well, Victor Lund of WAVGroup has done some research relevant to this topic, and I think it’s one worth thinking about. His research (available here: http://waves.wavgroup.com/Broker-Website-Effectiveness) showed that 69% of all visitors to a real estate website are direct visitors, meaning they either type your website domain name into the browser, or bookmark it. And the 20% that came via search, 78% of that group typed the name of the brokerage into the search box. In contrast, 100% of the people who actually land on your site are impacted by clutter and bad design. So if you’re short on time, and you have to make a decision which to emphasize, then I’d spend more time on simplifying design and making the site more effective for conversion. I hear you! It seems many believe that you have to put everything on the main page. The best example proving that wrong today is Google! It is tempting to feel that an overwhelming site equals credibility, I’ve started to look more to the experience of my potential client and genuinely them with enough information to want to find out more about my services. It is a process though. Thanks for the article, I know I’m not the only one that thinks this way.